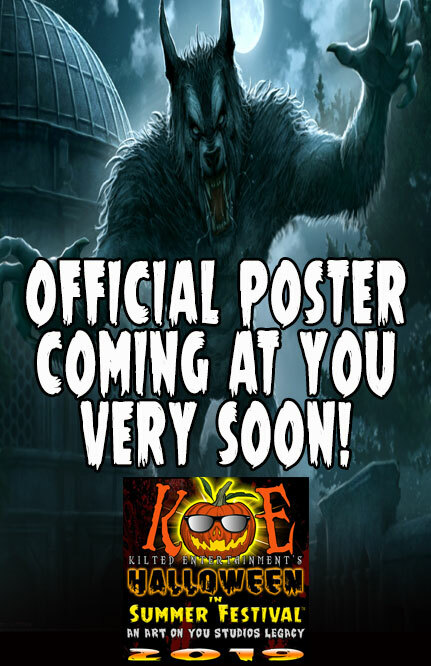 The highly anticipated "Creature Feature Show" will make its grand resurrection for the 2019 event! Join us for this spooktacular presentation that acts as an "opening ceremony" to the festival! For 2019, as has been the tradition for the past few years,we're again combining forces with another local favorite, "Magna Movie in the Park". Beginning at 8pm at Pleasant Green Park there will be musical entertainment by a talented band, TBA. Then, just as the sun sets behind the Oquirrhs, we'll be screening of "Hotel Transylvania 3"! There will also be a Very Special Guest Appearance that you don't want to miss!! The Halloween in Summer Festival main event will take place ALL DAY along Historic Magna Main from 8950 West to 9200 West. It's the "RESURRECTION", so show up ghostly, ghastly, vampiric, witchy, monstrous, or get your ghoulish makeup done at the event! The street will be filled with top notch Artists, Illustrators, Halloween Creators and Decorators, Costumers, Make-Up Artists, Haunters, a variety of Vendors, Food, Games, COSPLAY Contest, Vampires, Witches, Zombies, and MORE! There will be a Main Stage with bewitching and incredible entertainment from a number of performers hosted by Master of Ceremonies, Elias "Lefty" Caress! And, there will be the "Coors Creepy Cantina" brought to you by Coors/ Coors Light inside The Filling Station where there will be Second Stage entertainment! Be sure to also swing by the "Little Monsters Area" in "park area" next to the Main Street Grill! The street festival will go from 10am-8pm and is FREE (No Ticketed Admission) and ALL AGES FUN!! We are proud to announce that 2019 will once again host the Little Monsters Area! This year, we are placing this terrorific attraction right in the middle of the action, like last year, in the "park area" next to the Main Street Grill on Historic Magna Main. There you'll find a wide variety of activities and fangtastic fun for little monsters of all ages! Be sure to check back for details on what will be included! This is an ALL AGES Cosplay Contest that will be hosted at the Magna Public Library! ALL contestants under 12 must be accompanied by an adult. The Magna Public Library is located at the corner of 8950 West and Magna Main. Registration will begin at 4 pm and end promptly at 4:30am. The Cosplay Contest will begin at 4:30pm sharp. Judges will be nonbias and very experienced with Cosplay, Costuming, and Make-Up having backgrounds as Professional Make-Up Artists, Haunters, and Cosplayers. 1 - NO Real Weapons. 2 - Costumes MUST be handmade. Absolutely NO prepackaged, rental, or mass fabricated costumes will be accepted. 3 - You MUST be in line backstage 15 minutes prior to competition. 4 - ALL "Under 10" competitors MUST be accompanied by an adult on stage. 5 - There will be On Stage Questions. 6 - Contestant has 60 seconds to model their costume. 7 - We reserve the right to combine or cancel age groups depending on number of registrants. 8 - Winners MUST Be present for awards. This All Ages, annual event returns even bigger than ever! As in the past it will run from 5-7pm with participating Magna Main Businesses as well a selection of Vendors and Artists at their booths. Trick-or-Treaters are encouraged to honor Halloween traditions and Please Be In Costume! Young children must be accompanied by parents or guardians. Our Costumed Spooktacular Shindig will be ghastly amounts of fun climaxing our RESURRECTION event and celebrating another incredibly successful year with our Artists, Vendors, Ghoul Crew, Participants, Friends, Families, and Festival Goers! The invite is open to EVERYONE 21 and over. There's NO COVER! There will also be TONS of Give-Aways, a COSTUME CONTEST with a Grand Prize TBA, and Shake Your Pumpkin to the Live Music of a terrorific band TBA! It all takes place at the The Filling Station from 9pm-1am. 21+ with ID. Copyright © 2010–2019 Halloween in Summer Festival™. Kilted Entertainment™. All Rights Reserved.